Included as part of the Yeppoon Foreshore and Town Centre Revitalisation Project, Yeppoon’s beach amphitheatre stage roof has recently been completed in order to revitalise existing public spaces while creating tourism, recreation and commercial land opportunities within the Yeppoon Foreshore and Town Centre precinct. Built over the existing stage, the newly completed roof structure is now able to provide year-round protection with shelter for entertainers and performers as well as shade for beach-goers, a functional design with an aesthetical prerogative. In order to complete the functionality of this stage also at night, a colour changing LED system was required to provide both a dynamic stage lighting as well as a decorative effect. 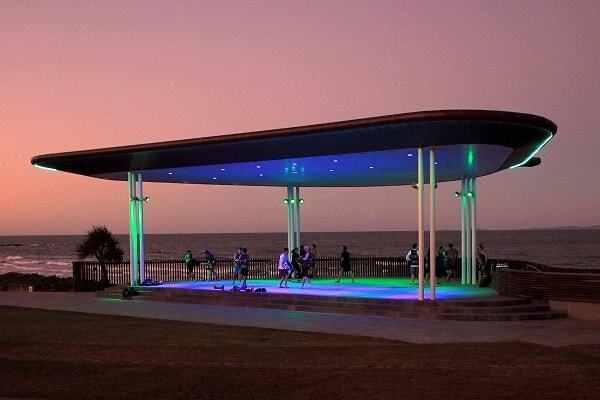 Quite unusual as an upside-down recessed application, 12 units of Ruby MR R were installed in the ceiling of Yeppoon’s beach amphitheatre to down light this multifunctional outdoor stage. Featuring a shallow recessed depth, Ruby MC R, an LED wall washer wash light specifically designed for exterior recessed applications allows a comfortable installation in this atypical upside down position. To complete the stage lighting, 12 units of Ruby MC were installed on each of the twelve structural poles supporting the stage roof in a three by three disposition. RUBY MC RGBW houses six high power RGBW full colour LEDs, as well as in-built electronics and power supply unit. This fixture is ideal for spot lighting and wall grazing owing to the wide selection of exchangeable optics groups available, ranging from spot aperture beams to wide distribution. This beach front stage has developed a lighting design that makes the stage area this multipurpose area more functional for everyday use, restores the spectacular views and complements the beachfront site.